Opposition leader Sergei Udaltsov entered the third day of a hunger strike Wednesday to protest his detention for 15 days on charges of disobeying police orders during a sanctioned weekend rally. Udaltsov, who heads the Left Front group, began the hunger strike when he was detained Sunday at the rally and plans to continue until his release Dec. 27, said his wife, Anastasia Udaltsova, who acts as the group's spokeswoman, Interfax reported. Left Front activists will be staging one-man pickets — the only form of public protest not requiring permission by authorities — outside City Hall to protest their leader's detention, Udaltsova said. 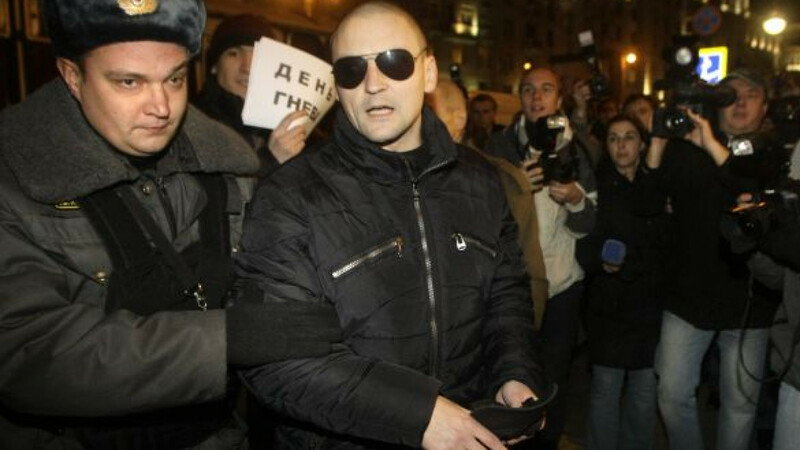 Udaltsov participated in a large anti-government rally on Pushkin Square and urged participants to head to City Hall to file their demands there after the event, only to see riot police block the peaceful march and detain him, he told Gazeta.ru. About 10 defense witnesses testified in the Tverskoi District Court on Tuesday that he did not disobey police orders. But the court dismissed their claims while accepting testimony from two police officers who detained Udaltsov, even though they offered conflicting accounts of the incident, a Left Front spokeswoman Udaltsova said. The judge, Olga Borovkova, sentenced Udaltsov to 15 days. She previously sentenced him to 12 days in jail last month for staging an unsanctioned Day of Wrath rally. He served the sentence and was released on Nov. 25. Udaltsov's apartment was attacked ahead of Sunday's rally, with attackers leaving insulting graffiti on the outside walls and sealing the front door with construction foam. No detentions have been reported in the case.